David Greig’s Outlying Islands was first produced in 2002, and has not been seen in London since then. It is an exceptional piece of dramatic writing, and Atticist’s intense and intelligent revival serves it well. It is 1939; John and Robert are two keen young ornithologists, fresh out of Cambridge, who have been sent by ‘the Ministry’ to study and document the extraordinary and hitherto unexamined bird population on a remote island in the Outer Hebrides. They will spend four weeks on the island – 40 miles from the nearest inhabited land – with no radio and no boat. Their only company will be the island’s leaseholder and his niece. The stage is thus set for a compelling play examining our relationship with wildness – in nature, in ourselves, and in one another. What happens to us when we are divorced from conventional societal mores? What is the role of science in our understanding of the natural world? The play is set at the outset of a long and bloody world war, in which millions of people are set to die; many of them young men, with an unwavering sense of faith and moral duty. What do those things actually mean? And what is it, really, to be free? These are big questions, and it takes a playwright at the height of their powers to wrestle with them without sacrificing humour, warmth and the wonderful messiness of being human. David Greig is that writer here, and is supported by deft direction and design and a very able cast. The production design perfectly reflects the island’s peculiar and seductive mix of austerity and profound, instinctive, animal, pleasure. There is nothing showy here, and yet we are continually aware – not least owing to Christopher Preece’s excellent sound design – of the wind, the waves, the birds, and the earthy warmth and comfort of the disused chapel. The huge wooden door, which separates the two worlds, dominates the set, and although the boys’ early slapstick interaction with it didn’t quite convince, it nonetheless remains a powerful physical metaphor throughout the piece, and the dangerous energy of the liminal space is palpable when the door is held open for a time in the gathering storm of the play’s second half. Jessica Lazar’s accomplished direction brings out the very best in her four-strong cast, and it is clear how grounded they each feel in the play’s reality. Jack McMillan is heartbreakingly believable as John – full of sweetness and enthusiasm, but ultimately unable to break through the many societal constrictions placed on him. By way of contrast, Tom Machell’s Robert is incisive, impulsive, mercurial; at home in this wild place from the moment he steps off the boat. Ken Drury is a splendid hoary presence as Kirk, and demonstrates considerable skill in his later transformation into the upright English Captain come to take the boys home, and the island’s lease-holders back to the mainland. And surrounded by all these men – a new circumstance for this solitary, cinema-loving creature – Ellen ultimately makes the island her own. Rose Wardlaw gives an extraordinary performance, and is utterly mesmerising throughout. As we watch her fill her lungs with air, stretch out her cramped wings and embrace the wildness within her, we too are transported to a place of dangerous possibility. 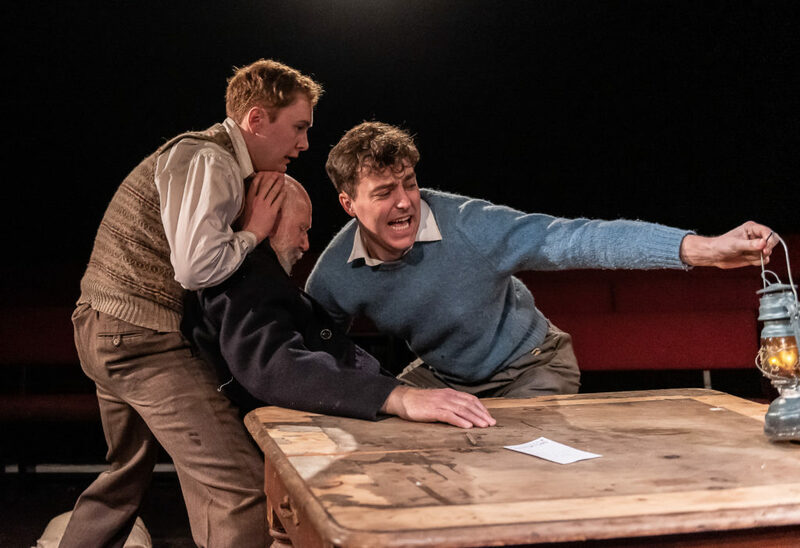 Outlying Islands is Atticist’s second production at the King’s Head, after its barnstorming revival of Steven Berkoff’s East, and its first as an Associate Company. It marks a fantastic beginning to an exciting artistic partnership; long may it continue.